Register Log In ECN Forum Forums Photos for General Discussion What's up with this? All the clues are here in this picture. I see all fuses have a blue dot. I guess this is for identifing their rated amperage. Maybe its overfused? The thick wire is on the same kind of "blue dot fuse" as the thin wire. Here in Holland a blue fuse is 20 amp. On a closer look, i noticed that all grounds are twisted together, but it isn't connected to anything. All grounds are floating ??? The grounds are pretty rough, but it looks as though they might be connected under the big wing-nut terminal on the upper left (exterior) of the box. I can't make out if it's actually connected or not, but it does look like a ground runs from there (it meets up with one from the black MEM box to the left and they disappear out of sight below the meter). 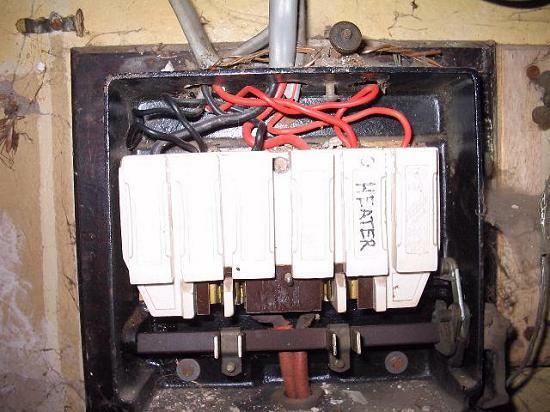 That black MEM fusebox is also one of the old double-pole fused-neutral types. 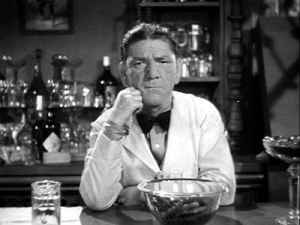 It's more a questions of "what is right with this?" It's a shoddy, deteoriating mess and needs to be completely ripped out and replaced. The main earth cable going back to the service fuse / bonding point looks way way too small. Given that this is a fused system with no RCDs or ELCBs a major ground fault could cause a fire as that cable doesn't look like it could handle 32+ Amps. The rule of thumb here in the old days was that the earthing had to be capable of holding out until a fuse blew. i.e. capable of safely handling the load of the largest fuse + a safety margin for a good few secs. There also appears to be a second bare earth cable going back into the terminal block / service fuse. Don't the regs require bonding to neutral at one point and at one point only? 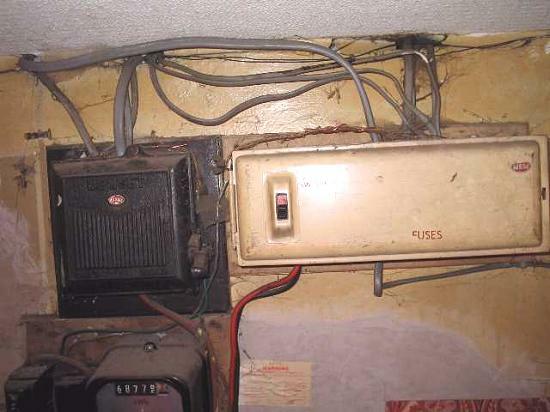 the fuse boxes look FAR older than the wiring too. I would assume, looking at them that they are pre 1950? Yet the cables look like they're from the 1970s. Why wouldn't the person involved have replaced the undersized and aging boxes? Was the original conduit ripped off the wall? There appears to be at least one clip remaining. It's certainly great to see a few Non-US pictures popping up in here. Keep it up, you can either send them to Bill, Electure, or me. When ever I see one of them old MEM Fuse-switch units, it usually means re-wire time. We had a 3-pole unit over here at one stage that caused all sorts of problems, it was used out in the country. It was designed to supply 2 phase 230V ranges. One guy here was nearly burned severely when he plugged his razor into a socket that was fed from a range that had one of these feeding it. Apparently, the guy that owned the house prior to him, had looped a plug off of the FS unit but had used the 2 phases (400V) and the neutral as the Earth. Going by the pictures Gideon, where is the cable protection where the cable enter the Fuse-Switch unit?. 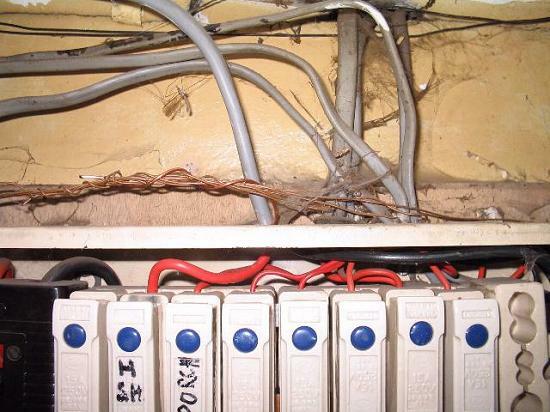 Having Basic Insulation showing (the wires themselves, as opposed to the cable sheathing) on a cable outside of a fitting or Switch-board is an Offence (Violation) here. Also some clips on the cables above the whole thing wouldn't go amiss, as well as the Meter Tails. 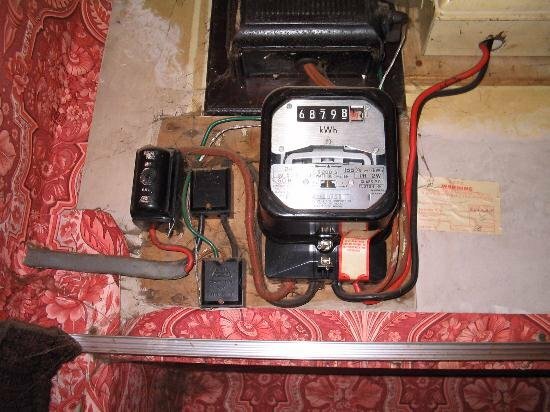 What's with that wire leaving the bottom of the FS unit?, is it missing a bit of Insulation, where it goes around the side of the meter below. Not a good piece of work at all!. Yes, the grounds are just twisted together outside each of the boxes, with a green wire from the black box and a bare wire from the yellow go down to a commoning block along with the incoming neutral. Wires going in everywhere, no grommets or clips anywhere. The nut on the top of the black box holds the lid shut. Paul, it is one of them old fused both in live and neutral units, and I have a question: were they originally intended to be installed without protective earth wiring? There appears to be no provision for it. I beleive the black box dates to 1954 when electricity was first arrived in the area, the yellow to 1969. 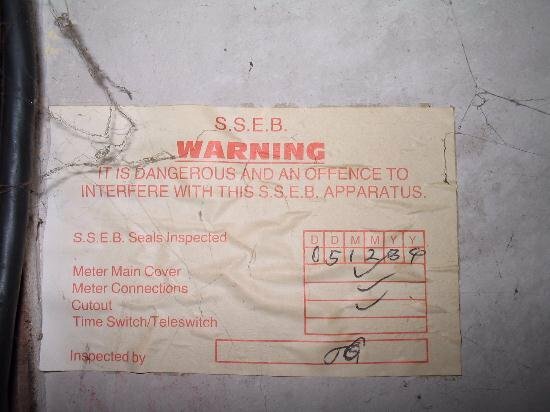 I think the meter was also replaced '69 as there is the shadow of a backing board to the left of the black box. It surprises me that the South of Scotland Electricity Board (SSEB warning sticker on the wall) happily connected this lot up to service. The meter tails feeding the black box are fabric covered. Didn't anyone spot the burning under the second fuse holder from the left?